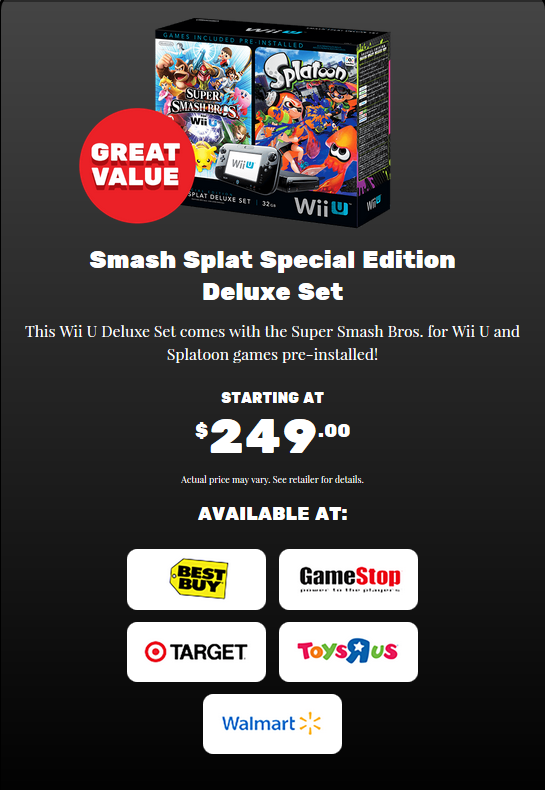 By LUDWIG VON KOOPA - It's the best Wii U deal I've ever seen. "Wii U has something for everyone leading us into the holidays. If you're still waiting to jump in, or looking for a great gift this season, keep an eye out for a new Wii U bundle this holiday. Featuring not just Super Smash Bros. For Wii U but also the surprise hit of the year: Splatoon." 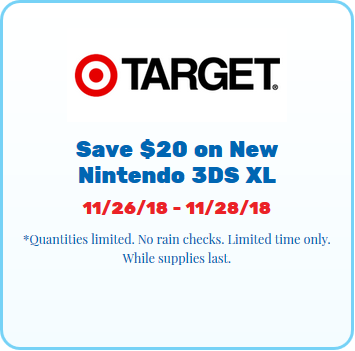 "Also, be on the look out for some great deals on the original Nintendo 3DS XL system. If either of those strikes your fancy, be ready come Black Friday." While according to our awesome feedback (and thanks for filling it out — and if you still haven't taken the KoopaTV Feedback Form Part I along with the KoopaTV Quiz Part I, what are you waiting for?! It's fun and rewarding! ), the majority of y'all have a Wii U and pretty much everyone already has a Nintendo 3DS, if you DON'T own them or you want to give a very good gift, here's your best chance ever. "Smash Splat Special Edition Deluxe Set" starting at $249.00! Not even $249.99! 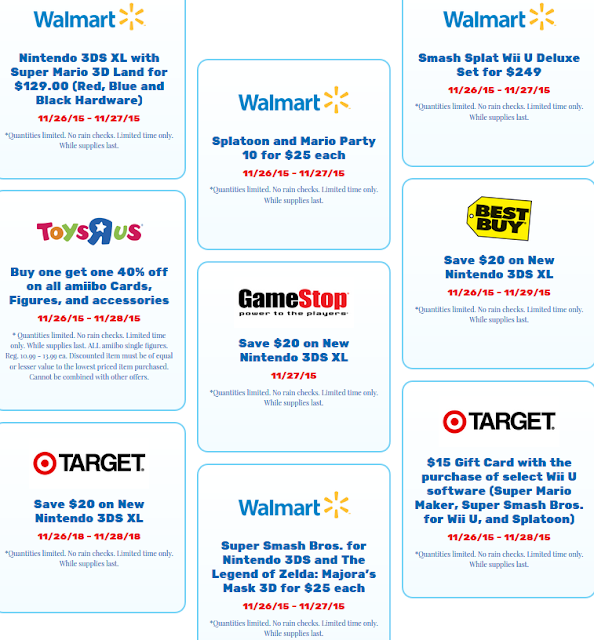 You can see more awesome Nintendo deals at Nintendo's special happy holidays deals page. The only reservation I'd have with this is you don't get the cool GameCube controller stuff with it. Nintendo also has these eShop-based sales right now. They all seem underwhelming, but right now Phoenix Wright: Ace Attorney Trilogy is 33% off at only $20. That's a bigger sale than eight months ago where it was only 25% off! Get it on your Nintendo 3DS if you haven't already. More great deals, but look at the unique-ness of the centre. That's right: There is consistency and continuity! We reported in our actual thematic Thanksgiving article a month ago that GameStop would be closed on Thanksgiving (11/26/2015). Meanwhile, every other retailer on that page has their deals starting today! So it looks like GameStop is staying true to their world, and is the only retailer to do so. 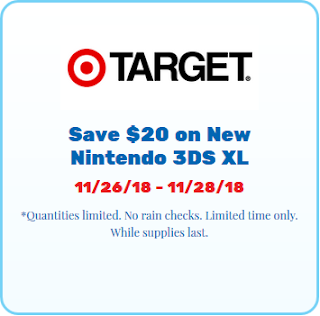 By the way, the Target deal on the lower-left really does say 11/26/18-11/28/18. Oh boy! I can't wait! Ludwig doesn't know if he'll buy anything videogame related in the upcoming days. Maybe Nintendo's repair service will be giving discounts. Or it'll just be closed. Whatever. Ludwig does make a Black Friday purchase: A New Nintendo 3DS XL! Looks like Ace Attorney Trilogy has another 33% off sale, for Christmas. Looks like they gave up on Wii U deals for Black Friday 2016, opting for a New Nintendo 3DS for $99.99. 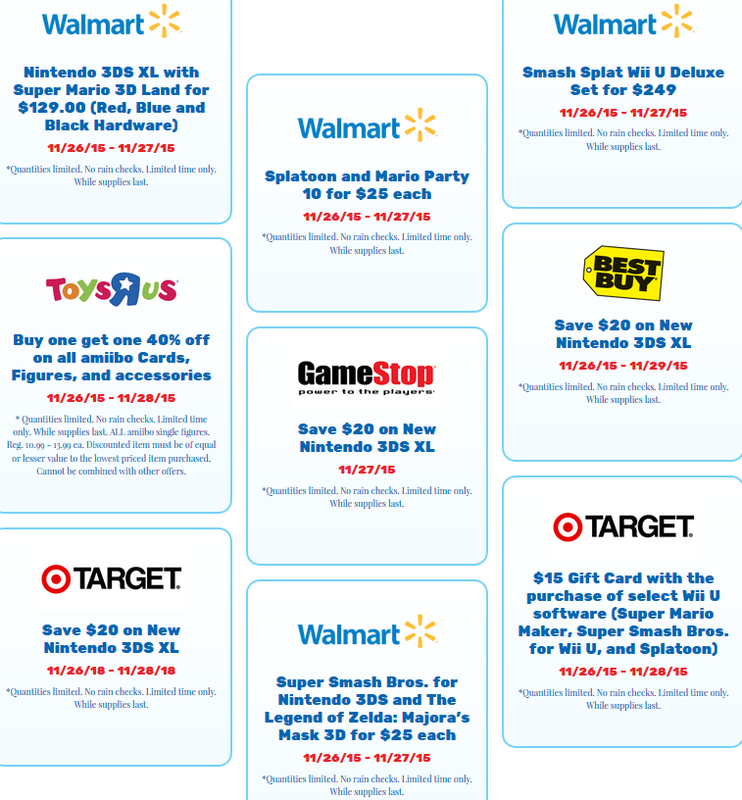 "amiibo figures (various) - $12.99 (GameStop)"
I like how MSRP is a "deal" though. So Target is advertising for 2018... meanwhile, CVS announced its Xbox One deals with a picture of the original Xbox. CVS Pharmacy sells game consoles?! Ahhh, Black Friday deals... I've never actually gone to Black Friday in my life, maybe I might give it a shot today. In other news, Splatoon and Smash players will have to deal with a ton of newbies. Can't wait. I'm happy about the Splatoon newbies, considering how terrible I am in that game compared to everyone else nowadays. Maybe I should use "pro" weapons and not the Splattershot Jr. If you haven't gone to the store yet you probably won't have any parking/inventory/space to walk now. But feel free to try it out and give your adventures. ...That's a super scrumptious deal though. That may be true. However, many stores, such as Walmart, will match the price with local competitors. "And you won’t do all your shopping online." Screw that sentence that's exactly what I'm trying to do. Anyway, I find it hard to believe that SEARS is on that list. Their whole business model is being OVERpriced!